Tell our visitors what inspired your ideas for creating monster mayhem in your baby's nursery.. was it a favorite book, a picture in a magazine, a crib bedding set or did you simply use your imagination to come up with the design? The baby's monster nursery theme room came together bit by bit. It started with our idea of inspiring future creativity with the chalkboard paint and moved to include whiteboards as well. We wanted to draw off of the grey and white color combination so we searched for simple modern furniture that featured both white and walnut colors. Finally, the colors of the books and the monsters brought the room to its completed state. What brand and paint colors did you use for the neutral portion and the chalkboard portion of the nursery walls? The Chalkboard paint is Eco-friendly EcosPaint in a color called "Chalkboard Slate". The neutral color was original and the white is Rustoleum brand whiteboard paint. If the two of you painted any designs or used special painting techniques, please tell us how you did it. All of the the painting in the room was completed with the help of painters tape. In order to prevent leakage under the tape, we applied matte medium to get the sharp lines that were required. What was the brand and style of the crib that you bought and where did you find it? The crib is from the Oeuf Classic Collection and we bought it from Riva's Eco Store. 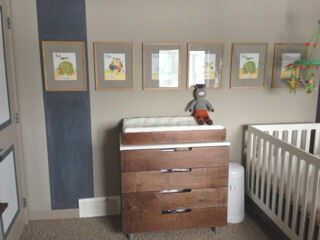 Was the nursery furniture that you chose also from an Oeuf collection? Did you buy it from the Eco Store as well? The baby's crib, changing table, bookshelf (and toy store in closet) are all from Oeuf. However, they were purchased from various online retailers. 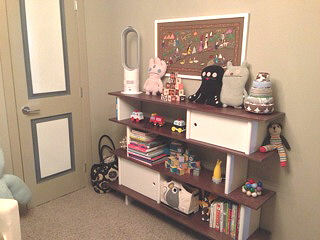 The bookshelf is Nurseryworks from Westcoast kids and the chair is Dutailier and also came from Westcoast kids. What kind of monster baby bedding set did you use? Where did you buy it? The crib bedding and changing pad is Nook Pebble Pure Sleep system bought from Westcoast Kids. We also have a blanket from Bla Bla and a sheep skin that was treated specifically for infant care by a local wool store. Tell us about the modern window treatments, nursery lighting, rugs, wall decor and accessories that worked for your monster nursery theme. Where did you buy them and did you make any of them yourself? The light is a Sputnik light that can be purchased through Restoration Hardware, the Felt area Rug was purchased in Nepal, the name is in frames purchased from Chapters, the picture above the bookshelf was hand embroidered in Egypt and most of the stuffed animals are either Ugly Doll or Bla Bla (including the baby mobile and the giant "zook"). The baby's blanket is Faux Chinchilla from Restoration Hardware. The heater/fan is from Dyson. The nightlight is OXO Candela Tooli and the blocks are from various collections manufactured by Uncle Goose. Did you choose special storage systems or organizers for all of the baby's items? All diapers/changing gear is organized inside the changing table along with many of the baby's clothes, pacifiers, swaddling blankets, etc. All of the larger blankets are stored inside the main linen closet. We use the bookshelves to store store and display the baby's books and "classic" toys. Inside the nursery closet, Oeuf Toy Store holds all additional baby items and gear. How long did it take you to complete the desired level of modern monster mayhem in the baby's nursery. Would you rate this decorating project as easy, fun or challenging and what was your favorite part in the process? We waited for about 3 months for various furnishings and items to arrive from different sites and the best part was waiting to see what would come each day. The knock on the door always brought something exciting! As a couple, it was an amazing project to complete while waiting for our first baby boy to arrive. Did you decorate the entire nursery on your own or did someone help you? If you had help, who was it and what did they do to help? The two of us designed and decorated the nursery together as a couple using inspiration from our travels and the feel that we have through the rest of our home. What do you love most about your baby boy's finished monster themed nursery room? We love everything about it! We just sit in the room and enjoy it while we are waiting for our little one to arrive. We feel that it is the most unique room we could have ever created and hope that it will inspire him as he grows. 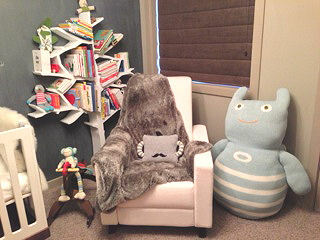 Your Monster Theme Baby Nursery is really impressive! I love it! I like the way you have done your room. It has unique features that can be modified as your child grows, not limiting the child to a single theme. Big plus for the chalkboards and whiteboards. I will definitely be looking into them for my next room.